Good books are very useful for a child’s growth and development; therefore books should become children’s close friends. For parents who often reading books or going to bookstores, choosing a book for child is not difficult. But for parents who rarely visiting a bookstore and don’t like to read, it could be difficult to select the proper books for their kids. Choosing the right book for kids is necessary so that kids are easy to read and understand the book. The age of children can be taken into consideration when selecting a book. 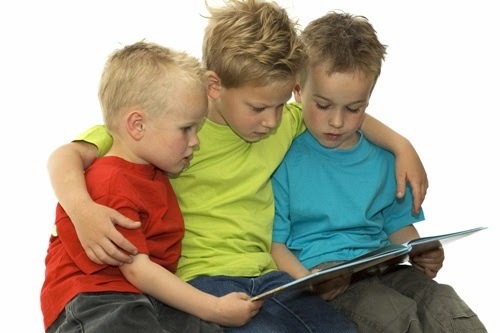 In addition, the child's interest is also noteworthy if the child can read already and have a favorite reading. As a parent, you need to establish communication with the child about his favorite reading certain books. There are some publishers who provide the book information on its age-appropriate. However, there are some other publishers who don’t mention such information. You can find it on the top right or bottom right at the cover or on the left side at the front or back cover. 2. Attractive colors and images. Books with interesting colors and pictures will make children interested in reading it. Moreover, it's been more and more books are accompanied by attractive bonus in it. 3. The sentence patterns are simple and easy to understand. Choose a book with simple and uncomplicated sentence patterns. The words should be easy to understand and unambiguous.The complicated words will be difficult to be understood by children, for example, scientific words without explanation. The story with back and forth flow would be difficult to understand. You should select books with simple flow so easily understood. 5. The story theme based on the lives of children and recognizable characters. Select only books which have setting on the lives of children. For example, kids at school, village kids and so on. Similarly, the characters in the book are also easy to recognize. A book with attractive packaging; for example is the book with lots of pictures and colors. In addition, for under-five aged kids can also be given books with thick cover which not easily torn or damaged. It’s required to anticipate the book for not easily damaged when younger kids playing with the book. You don’t need to hesitate buying books for your children so that they will be more interested in reading the book and get a good result. Yes, it seems important to choose the right and engaging book for children ! !